Ok so I guess I’m a bit biased – I’ve been using Palms (and earlier PDAs) for a long time. I’m 34 now, and I started using PDAs when I was 16 (yeah, I’m a computer nerd). I’ve been able to keep the same memos, address book, and date book for a very, very long time. Through many different Palm devices. As long as I back up the data, I’m good. I just bought a second Tungsten C here actually, as a backup in case my primary one gets lost, stolen or broken. My love for Palm’s simplicity in their primary applications (addressbook, memopad) and my love for the third-party apps I have come to depend on (Strip, Datebk6) is what keeps me from thinking “well, my cell phone has most of this functionality, why don’t I just use that?” I’ll tell you why. Because my wife washed my cell phone the other day. I’m probably going to upgrade my cellphone, and with the market/technology changing so quickly, I’d be crazy if I thought I could retain almost 15 years worth of data in a device that is going to become obsolete in a year. Palm sidesteps this with their older devices in that they are so PLENTIFUL to obtain and so insanely COMPATIBLE that you could pick up any old Palm and be able to restore your data easily. I own a technical consulting and support business, and use my Palm for appointments, tasks, addresses, notetaking, keeping encrypted passwords, etc… Thinking that a cell phone SHOULD do these tasks, I have found, is just insane. I want to keep them separate so I’m not tied to a certain cellphone for life. My Tungsten is my #1 receptionist – I rely on it for everything, even now in 2014. 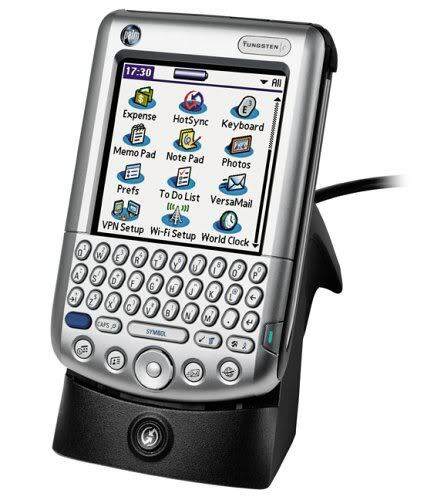 Palm devices have never let me down when it comes to tackling what a true “personal data assistant” should do. IMHO the Tungsten C is the best of breed PDA.